I love to travel. I love to eat. I suspect many of you are the same. One of the best things about traveling, to me and many of us, is experiencing the food and culinary culture of new places. I love trying street food, taking cooking lessons, visiting markets, asking locals for their favorite restaurants, and many other ways of getting to really know the food culture from the inside. 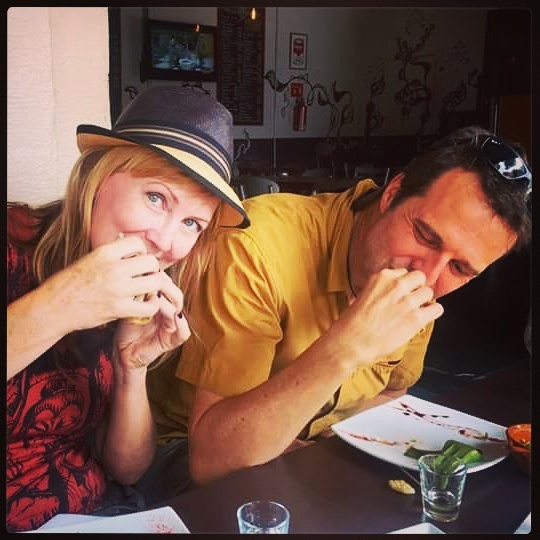 A great way to do this is by taking a culinary tour, which I had the lovely — and delicious — opportunity to do a few weeks ago when Keith and I were in Mexico City with GoEatGive. This nonprofit travel organization arranges trips to places like India, Kenya, Indonesia, Cuba and Mexico that combine sightseeing, culinary delights and volunteerism. It was my first time to the city, and I found it exciting, vibrant, amazingly clean (including the air) with a good amount of green spaces; diverse and hugely artistic/cultural; and an astounding gastronomic scene — from fine, upscale dining to modest little family-run establishments. Our small group took our foodie tour around the Colonia Roma neighborhood; a fascinating place that had become quite run-down and unsafe at one point, but by the early 2000s was being renovated and given a new spark of life by creatives, urban pioneers, and those who loved the historic architecture of Roma and wanted to preserve it. Guide Salimah Cossens shows us around beautiful Colonia Roma. Photo by Keith Hajovsky. This creative, independent vibe soon made it a hotbed for gastronomic inventiveness and greatness. The culinary journey was with Sabores Mexico, who use 6 guides who know the area well, and take the tour groups to 7 stops that all not only serve some of the highest quality food in Colonia Roma that showcase fresh Mexican ingredients; but also are each independently/family owned and operated. In between each stop as we walked from place to place, Salimah stopped to tell about the history of Roma and to point out interesting places or pieces of architecture. The informative walking tour was (almost) as good as the food! This was our first stop, where we met our guide Salimah Cossens. This “taqueria de puerto” specializes, as the name suggests, in ingredients from the sea such as fish and shrimp; but they also have traditional taco ingredients such as carnitas and pibil style pork. We had the Tacos des carnitas de pescado (sumptuous fish tacos dusted with pork cracklings) and sope camarones (a sope, or sort of thick masa tortilla, topped with shrimp, cheese and crema). There were three different salsas to choose from, lime to give that fresh squeeze of acidic brightness, and fresh-made horchata to wash it all down. Although this was only the first stop of the day, the food turned out to be in my top 2 favorites. This is a French bistro — I told you Mexico City was a very international foodie scene! Even though this is a French restaurant, Galia still uses regional Mexican ingredients in their dishes, including cheeses and breads — although the wine is all imported from France. Colonia Roma has a very French feel, with its wide boulevards, Haupmann-esque buildings and sidewalk cafés, and so Galia is a very fitting place here. Besides being a bistro, it also sells fresh and prepared foods in its market and is a catering company. We had the spectacular terrine, their specialty that is like a rich pâté, with incredible depth of flavor; and the perfect red wine pairing, Chappelle du Prieuré. This simple little place serves some of the best tamales in the city. It’s owned and run by the brother and sister team of Mardonio and Paula Carballo, who serve the traditional, indigenous foods of their home state, Veracruz. It’s a small restaurant, with only a few tables inside and a couple more on the sidewalk. We were served a trio of tamales that included a sweet corn, moist black bean and chicken. Alongside were some mild-to-spicy salsas and rich coffee.Hey, don’t take my word for how fantastic this place is: Andrew Zimmern included it on his list of 5 places you have to eat at in Mexico City! On an interesting side note, Mardonio is also a very accomplished poet, writer, actor and journalist. Ah, how Keith and I both love beer, wine and cocktail tastings anywhere! La Graciela is a “taller de cerveza” — beer maker — and the brewery is also a little gastro-brewpub. To add to that, the brewmaster is a woman, Estrella; pretty rare in this business. It’s one of the only craft breweries in the area, and Estrella brews both some traditional ales and IPAs, as well as some beers with more interesting flavor profiles, such as berries. This is another very simple, family-run place that serves authentic food from proprietor Juan Carlos’ home state of Oaxaca. He not only makes all of the restaurant’s tlayudas (an iconic Oaxacan street snack of grilled flatbread with filling, sometimes called a Mexican pizza) in the traditional Oaxacan style, but he also uses only fresh products that he brings in from Oaxaca. The tlayudas are available with many different fillings including the traditional dried meats, beans and cheese. There are fewer than a dozen tables in the place and Juan Carlos is usually there. And don’t miss another of his specialties: mezcal ice cream! Part cervezaria, part mezcaleria and part restaurant, this place gives off a very hip, trendy sort of vibe and there were a lot of artsy types about. Their bar is well-stocked with a lot of choices in both beer and mezcal, with flight tastings available for each; and an inventive food menu with specialties such as suckling pig tacos and octopus cake in ink. Their menu specialty is the fish taco, which is wrapped beautifully with a banana leaf strip. They also brew their own beer onsite, and even offer hands-on beermaking courses. As a business, they also strive to be eco-friendly in their practices (they don’t use straws or stir sticks) and in the decor, which features salvaged pieces, organic products and hydroponic plants. We enjoyed the fish taco specialty alongside a mezcal tasting, complete with chili powder and orange slice (as opposed to the traditional salt and lime for tequila). Well, Keith enjoyed the mezcal and I just tasted it — I confess to NOT AT ALL being a fan of mezcal. Just give me a good glass of wine any day. Since we were all pretty full by stop #5 and about ready to fall into a food coma, it was fitting that our last stop was at this artisinal coffee shop. It is walk-in, counter service only and the name is entirely fitting — at this place, making coffee is truly an art. They made us a delightful fresh-brewed coffee with a fresh-squeezed lemon juice and condensed milk concoction, shaken together. It sounds a bit odd, but it was amazingly delicious, and one of their own creations. Watching them work was like watching one of the highest mixologists at work, and the result was delicious. All in all, I highly recommend this gastronomic tour to anyone heading to Mexico City. You get great insight into the neighborhood and some history of the city, and are introduced to wonderful independently run businesses and their entrepreneurs. Oh, and the best part: enjoying phenomenal food and drinks. Sabores Mexico tours are available for 1-14 people and are $50 per person. Visit GoEatGive.org to check out their upcoming trips.